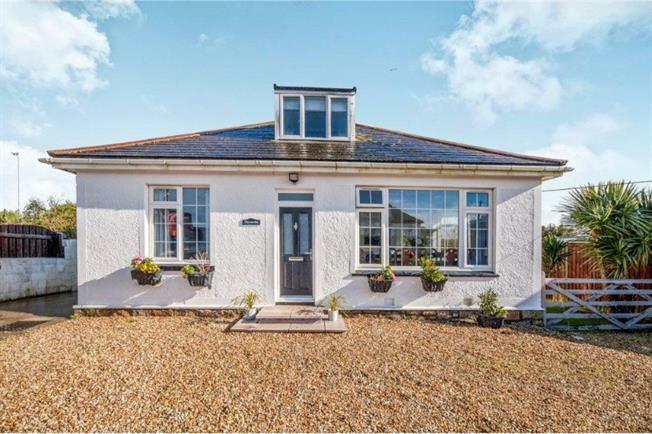 4 Bedroom Detached Bungalow For Sale in St. Ives for Asking Price £485,000. The property is set in a generous plot with a large parking area and has a garage. The property itself offers exceptionally well presented accommodation with a reception hallway which leads to a lounge , two double bedrooms and a family bathroom, a dinning room which leads through to the kitchen/breakfast room and rear porch. Upstairs are two bedrooms ,one of which has a separate WC.. The gardens are mainly to the side and rear which are laid to lawn and enclosed by fencing. Enter through an entrance vestibule. Fitted carpet, heating radiator, under stairs cupboard. Oak door, heating radiator, fitted carpet, double glazed window to the rear. Oak door, fitted carpet, heating radiator, double glazed window to the front, coved ceiling, inset spotlights. A particularly sunny room with double glazed windows to the front and side, heating radiator, fitted carpet, inset spotlights. A luxuriously appointed bathroom fitted with a white suite comprising of spa bath with a fixed head shower over and glazed side screen, low level WC, wash hand basin, tiled walls, heated towel rail, obscure double glazed window to the side. An attractively fitted kitchen with a range of base and wall units with granite effect work surfacing over, stainless steel one and a half bowl sink and drainer with mixer tap and tiled surrounds. Electric oven, gas hob and extractor, tiled floor, door to porch. Useful porch for coats and shoes etc, with back door to steps and rear garden. Low level WC and sink, Velux style window. Sloping ceiling with roof window, recessed lighting and fitted carpet. Access to eaves storage.